Found 2 file extension associations related to ePublisher and 2 file formats developed specifically for use with ePublisher. ePublisher Platform is a suite of three applications (Express Plan, Designer Plan, Publisher AutoMap) used to create on-line content. 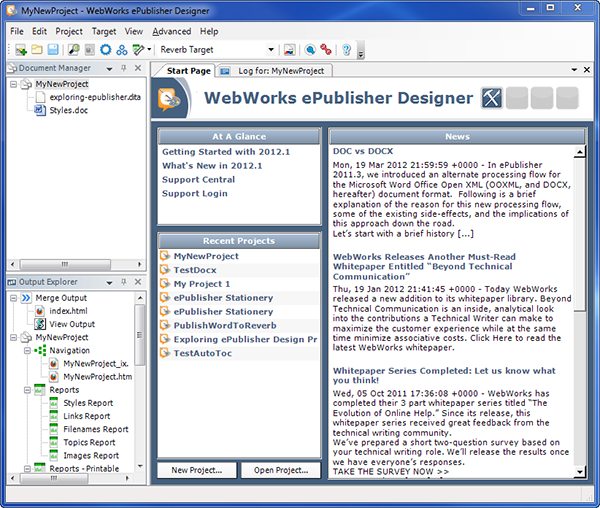 Using the ePublisher Express component your content developers can run reports, proof online output and deliver final online content using your Stationery created with ePublisher Pro. The ePublisher Platform is for writing groups that convert and deliver their online content. The Designer Plan consist of two components, ePublisher Pro for developing the look and feel of your online deliverables, and ePublisher Express for on-demand testing and quality assurance. The ePublisher Pro component is used to create, maintain, and deploy your ePublisher Stationery. AutoMap is for writing groups that have frequent updates of their online content, would like to integrate online help deliverables into a software build, or want to utilize the power of a content management system. The ePublisher Server package gives full access to the powerful and flexible ePublisher AutoMap component. If you need more information please contact the developers of ePublisher (WebWorks), or check out their product website.